Box Text: Double the fun! Take all the crazy action of the celebrated Mario Kart series…and multiply it by two! In Mario Kart: Double Dash! !, each kart holds two racers that can switch places at any time, so choose from a huge cast of favorites and pair them up any way you see fit! Foes… or friends! In Co-op mode, one player drives and the other punches, kicks, steals items, and helps out with turbo boosts! All new modes! Race your pals or duke it out in one of three hectic multiplayer battle modes- Balloon Battle, Shine Thief, and Bob-Omb Blast! Items galore! Each character can get a unique special item, like a giant Chin Chomp, as well as classic items like homing Red Shells and Mushrooms! Get connected! Link up Nintendo GameCube systems using Broadband Adaptors (sold separately) for wild LAN races and battles! 01-20-2016 aliensstudios Box Text Double the fun! Take all the crazy action of the celebrated Mario Kart series…and multiply it by two! 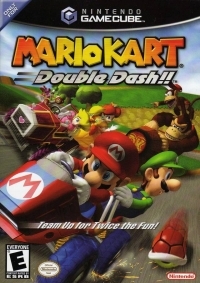 In Mario Kart: Double Dash! 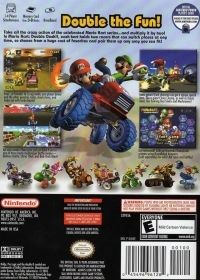 !, each kart holds two racers that can switch places at any time, so choose from a huge cast of favorites and pair them up any way you see fit! Foes… or friends! In Co-op mode, one player drives and the other punches, kicks, steals items, and helps out with turbo boosts! All new modes! Race your pals or duke it out in one of three hectic multiplayer battle modes- Balloon Battle, Shine Thief, and Bob-Omb Blast! Items galore! Each character can get a unique special item, like a giant Chin Chomp, as well as classic items like homing Red Shells and Mushrooms! Get connected! Link up Nintendo GameCube systems using Broadband Adaptors (sold separately) for wild LAN races and battles! 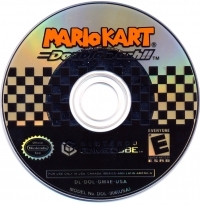 This is a list of VGCollect users who have Mario Kart: Double Dash!! in their Collection.